The mole is the most important concept in chemistry, serving as a bridge that connects all the different quantities that you’ll come across in chemical calculations. The coefficients in chemical reactions tell you about the reactants and products in terms of moles, so most of the stoichiometry questions you’ll see on the test will be exercises in converting between moles and grams, liters, molarities, and other units. Avogadro’s number describes how many atoms are in a single mole of any given element. Much like a dozen is always 12, Avogadro’s number is always 6.02 × 1023. While it technically can be used to count anything, due to its extremely large value it is usually only used to count subatomic particles. Within the confines of this book, it will be used to count atoms, molecules, or ions, depending on the problem. Moles and grams can be related using the atomic masses given in the periodic table. Atomic masses on the periodic table are given in terms of atomic mass units (amu), but an amu is the same as a gram per mole, so if 1 carbon atom has a mass of 12 amu, then 1 mole of carbon atoms has a mass of 12 grams. We’ll talk more about the ideal gas equation in Chapter 4, but for now, you should know that you can use it to calculate the number of moles of a gas if you know some of the gas’s physical properties. All you need to remember at this point is that in the equation PV = nRT, n stands for moles of gas. 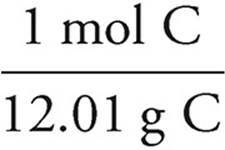 The equation above gives the general rule for finding the number of moles of a gas. Many gas problems will take place at STP, or standard temperature and pressure, where P = 1 atmosphere and T = 273 K. At STP, the situation is much simpler and you can convert directly between the volume of a gas and the number of moles. That’s because at STP, one mole of gas always occupies 22.4 liters. We’ll talk more about molarity in Chapter 4, but for now you should realize that you can use the equations that define these common measures of concentration to find the number of moles of solute in a solution. Just rearrange the equations to isolate moles of solute. To solve many problems on the AP Chemistry exam, you will need to use percent composition, or mass percents. Percent composition is the percent by mass of each element that makes up a compound. It is calculated by dividing the mass of each element or component in a compound by the total molar mass for the substance. Calculate the percent composition of each element in calcium nitrate, Ca(NO3)2. 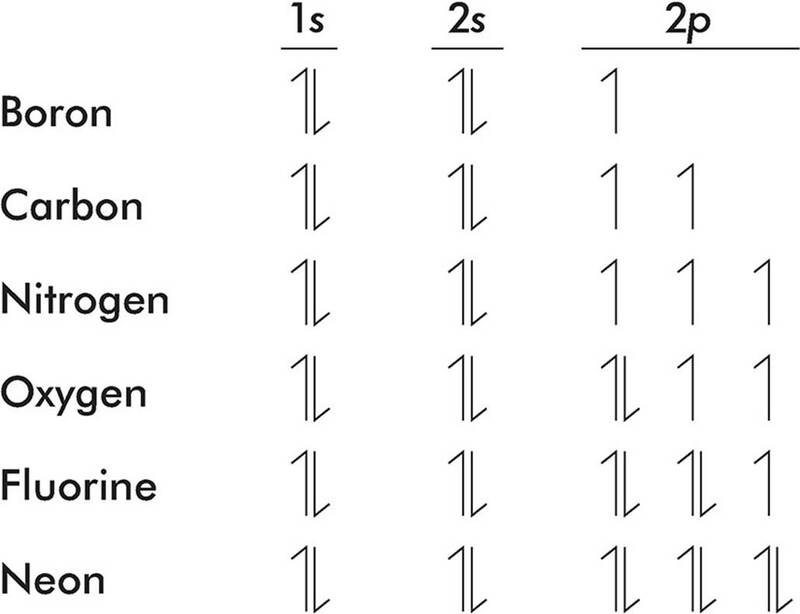 To do this, you need to first separate each element and count how many atoms are present. Subscripts outside of parentheses apply to all atoms inside of those parentheses. Then, multiply the number of atoms by the atomic mass of each element. Adding up the masses of the individual elements will give you the atomic mass of that compound. Divide each individual mass by the total molar mass to get your percent composition. You can check your work at the end by making sure your percents add up to 100% (taking rounding into consideration). 24.42% + 17.07% + 58.50% = 99.99% Close enough! You will also need to know how to determine the empirical and molecular formulas of a compound given masses or mass percents of the components of that compound. Remember that the empirical formula represents the simplest ratio of one element to another in a compound (e.g., CH2O), while the molecular formula represents the actual formula for the substance (e.g., C6H12O6). A compound is found to contain 56.5% carbon, 7.11% hydrogen, and 36.4% phosphorus. We start by assuming a 100 gram sample; this allows us to convert those percentages to grams. After we have that done, each element needs to be converted to moles. We then divide each mole value by the lowest of the values. In this example, that would be the phosphorus. It is acceptable to round your answers if they are close (within 0.1) to a whole number. Those values become subscripts, so the empirical formula for the compound is C4H6P. 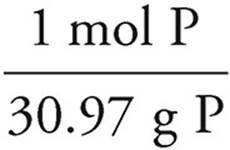 b) If the compound has a molar mass of 170.14 g/mol, what is its molecular formula? First, we determine the molar mass of the empirical formula. Then, we divide that mass into the molar mass. Finally, multiply all subscripts in the empirical formula by that value. So, the molecular formula is C8H12P2. The positively-charged nucleus is always pulling at the negatively-charged electrons around it, and the electrons have potential energy that increases with their distance from the nucleus. It works the same way that the gravitational potential energy of a brick on the third floor of a building is greater than the gravitational potential energy of a brick nearer to ground level. The energy of electrons, however, is quantized. That’s important. It means that electrons can exist only at specific energy levels, separated by specific intervals. It’s kind of like if the brick in the building could be placed only on the first, second, or third floor of the building, but not in-between. The Aufbau principle states that when building up the electron configuration of an atom, electrons are placed in orbitals, subshells, and shells in order of increasing energy. The Pauli Exclusion Principle states that the two electrons which share an orbital cannot have the same spin. One electron must spin clockwise, and the other must spin counterclockwise. Hund’s rule says that when an electron is added to a subshell, it will always occupy an empty orbital if one is available. Electrons always occupy orbitals singly if possible and pair up only if no empty orbitals are available. Watch how the 2p subshell fills as we go from boron to neon.